Lawrence Lessig, an influential activist of the free-culture movement, in 2005. The movement objects to over-restrictive copyright laws. Many members of the movement argue that such laws hinder creativity. They call this system "permission culture." Creative Commons is an organization started by Lawrence Lessig which provides licenses that permit sharing and remixing under various conditions, and also offers an online search of various Creative Commons-licensed works. The free-culture movement, with its ethos of free exchange of ideas, is aligned with the free and open-source-software movement. Today, the term stands for many other movements, including open access (OA), the remix culture, the hacker culture, the access to knowledge movement, the Open Source Learning, the copyleft movement and the public domain movement. In the late 1960s, Stewart Brand founded the Whole Earth Catalog and argued that technology could be liberating rather than oppressing. He coined the slogan Information wants to be free in 1984 against limiting access to information by governmental control, preventing a public domain of information. In 1998, the United States Congress passed the Sonny Bono Copyright Term Extension Act which President Clinton signed into law. The legislation extended copyright protections for twenty additional years, resulting in a total guaranteed copyright term of seventy years after a creator's death. The bill was heavily lobbied by music and film corporations like Disney, and dubbed as the Mickey Mouse Protection Act. Lawrence Lessig claims copyright is an obstacle to cultural production, knowledge sharing and technological innovation, and that private interests – as opposed to public good – determine law. He travelled the country in 1998, giving as many as a hundred speeches a year at college campuses, and sparked the movement. It led to the foundation of the first chapter of the Students for Free Culture at Swarthmore College. In 1999, Lessig challenged the Bono Act, taking the case to the US Supreme Court. Despite his firm belief in victory, citing the Constitution's plain language about "limited" copyright terms, Lessig only gained two dissenting votes: from Justices Stephen Breyer and John Paul Stevens. In 2001, Lessig initiated Creative Commons, an alternative "some rights reserved" licensing system to the default "all rights reserved" copyright system. Lessig focuses on a fair balance between the interest of the public to use and participate into released creative works and the need of protection for a creator's work, which still enables a "read-write" remix culture. The term “free culture” was originally used since 2003 during the World Summit on Information Society to present the first free license for artistic creation at large, initiated by the Copyleft attitude team in France since 2001 (named free art license). It was then developed in Lawrence Lessig's book Free Culture in 2004. In August 2003 the Open Content Project, a 1998 Creative Commons precursor by David A. Wiley, announced the Creative Commons as successor project and Wiley joined as director. In 2005/2006 within the free-culture movement, Creative Commons has been criticized by Erik Möller and Benjamin Mako Hill for lacking minimum standards for freedom. Following this, the Definition of Free Cultural Works were created as collaborative work of many, including Erik Möller, Lawrence Lessig, Benjamin Mako Hill and Richard Stallman. In February 2008, several Creative Commons licenses were "approved for free cultural works", namely the CC BY and CC BY-SA (later also the CC0). Creative commons licenses with restrictions on commercial use or derivative works were not approved. In October 2014 the Open Knowledge Foundation described their definition of "open", for open content and open knowledge, as synonymous to the definition of "free" in the "Definition of Free Cultural Works", noting that both are rooted in the Open Source Definition and Free Software Definition. Therefore, the same three creative commons licenses are recommended for open content and free content, CC BY, CC BY-SA, and CC0. The Open Knowledge foundation defined additionally three specialized licenses for data and databases, previously unavailable, the Open Data Commons Public Domain Dedication and Licence (PDDL), the Open Data Commons Attribution License (ODC-BY) and the Open Data Commons Open Database License (ODbL). 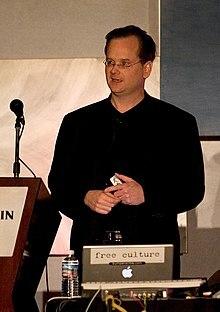 The organization commonly associated with free culture is Creative Commons (CC), founded by Lawrence Lessig. CC promotes sharing creative works and diffusing ideas to produce cultural vibrance, scientific progress and business innovation. Student organization FreeCulture.org, inspired by Lessig and founded 2003. The Building blocks are a symbol for reuse and remixing of creative works, used also as symbol of the Remix culture. QuestionCopyright.org is another organization whose stated mission is "to highlight the economic, artistic, and social harm caused by distribution monopolies, and to demonstrate how freedom-based distribution is better for artists and audiences." QuestionCopyright may be best known for its association with artist Nina Paley, whose multi-award-winning feature length animation Sita Sings The Blues has been held up as an extraordinarily successful example of free distribution under the aegis of the "Sita Distribution Project". The web site of the organization has a number of resources, publications, and other references related to various copyright, patent, and trademark issues. The student organization Students for Free Culture is sometimes confusingly called "the Free Culture Movement," but that is not its official name. The organization is a subset of the greater movement. The first chapter was founded in 1998 at Swarthmore College, and by 2008, the organization had twenty-six chapters. The free-culture movement takes the ideals of the free and open source software movement and extends them from the field of software to all cultural and creative works. Early in Creative Commons' life, Richard Stallman (the founder of the Free Software Foundation and the free software movement) supported the organization. He withdrew his support due to the introduction of several licenses including a developing nations and the sampling licenses and later restored some support when Creative Commons retired those licenses. The free music movement, a subset of the free-culture movement, started out just as the Web rose in popularity with the Free Music Philosophy by Ram Samudrala in early 1994. It was also based on the idea of free software by Richard Stallman and coincided with nascent open art and open information movements (referred to here as collectively as the "free-culture movement"). The Free Music Philosophy used a three pronged approach to voluntarily encourage the spread of unrestricted copying, based on the fact that copies of recordings and compositions could be made and distributed with complete accuracy and ease via the Internet. The subsequent free music movement was reported on by diverse media outlets including Billboard, Forbes, Levi's Original Music Magazine, The Free Radical, Wired and The New York Times. Along with the explosion of the Web driven by open source software and Linux, the rise of P2P and lossy compression, and despite the efforts of the music industry, free music became largely a reality in the early 21st century. Organizations such as the Electronic Frontier Foundation and Creative Commons with free information champions like Lawrence Lessig were devising numerous licenses that offered different flavors of copyright and copyleft. The question was no longer why and how music should be free, but rather how creativity would flourish while musicians developed models to generate revenue in the Internet era. Similarly, in 1999 Stallman said that he sees "no social imperative for free hardware designs like the imperative for free software". Other authors, such as Joshua Pearce, have argued that there is an ethical imperative for open-source hardware, specifically with respect to open-source-appropriate technology for sustainable development. Later, Stallman changed his position slightly and advocated for free sharing of information in 2009. But, in 2011 Stallman commented on the Megaupload founder's arrest, "I think all works meant for practical uses must be free, but that does not apply to music, since music is meant for appreciation, not for practical use." In a follow up Stallman differentiated three classes: Works of practical use should be free, Works representing points of view should be shareable but not changeable and works of art or entertainment should be copyrighted (but only for 10 years). In an essay in 2012 Stallman argued that video games as software should be free but not their artwork. In 2015 Stallman advocated for free hardware designs. Vocal criticism against the free-culture movement comes from copyright proponents. Prominent technologist and musician Jaron Lanier discusses this perspective of Free Culture in his 2010 book You Are Not a Gadget. Lanier's concerns include the depersonalization of crowd-sourced anonymous media (such as Wikipedia) and the economic dignity of middle-class creative artists. Andrew Keen, a critic of Web 2.0, criticizes some of the Free Culture ideas in his book, Cult of the Amateur, describing Lessig as an "intellectual property communist." The decline of news media industry's market share is blamed on free culture but scholars like Clay Shirky claim that the market itself, not free culture, is what's killing the journalism industry.